After spending the weekend in Lahaina, I drove back along the beautiful coastline and up through the central valley of Maui to spend Monday morning visiting Iao Middle School. I spoke with two groups of students in the library who were in the process of making their own books. They gave me a gorgeous orchid lei and another lei made of little macadamia nut packets. I was especially grateful for the mac nut snacks later when my friend took us on a hike up the Waihe`e Ridge Trail. We were very hungry when we got back to the car! I dried the orchid lei, and still have it hanging in my art studio as a reminder of my visit to Maui. The students asked some good questions about the book-making process. I hope the information will help them do a good job on their own projects. I spent the afternoon at the Maui Ocean Center, where I painted some gorgeous fish in my journal, then I drove to the airport to pick up my husband, Gabriel. As we drove back along the coast to Lahaina, we watched the sun set into the ocean, and I thought this might have been one of the best school visit days I’ve had in a long time! Who could pass up the chance to visit Maui in the winter? My husband and I took a break from the mainland before Christmas to visit a close high school friend whose grandparents live in Kaanapali. 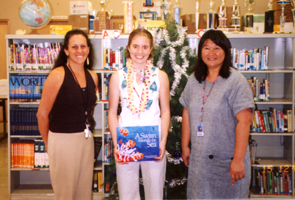 Since my most popular book, A Swim through the Sea, is about the ocean, I worked out a couple of school visits. I spent a whole day at Waihe`e Elementary School, which is tucked into a lush, untouristy part of the island, on the north side. The students presented me with a gorgeous orchid lei, as you can see in the picture. 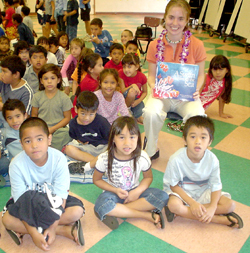 I was thrilled to see that the kids knew many of the species in my ocean book – especially the humpback whale! I even learned the Hawaiian words for some of the animals. He`e means octopus, for example. Mrs. Heyd (my teacher contact) even took me to see the beautiful Iao Valley after school. Thank you for the hospitality, Waihe`e School! One thing for which I am grateful this Thanksgiving is the opportunity to talk with the students and teachers at San Ramon Valley Christian Academy in Danville, California. This school visit fit in well with a Thanksgiving reunion with my husband Gabriel’s family in the Bay Area. SRVCA has a fantastic powerpoint setup which made it very easy to show the students the colorful artwork in my books. Thank you SRVCA!